From the fifth century onward, Manazkert had its own diocese, as testified by consecutive centuries of records of attendances at various ecumenical councils. One such council, a joint Armenian-Assyrian assembly, was convened in 726 in Norati (Noradin), a village situated fifteen kilometers (nine miles) northwest of Manazkert, to settle differences between the two eastern churches that arose from the teachings of anti-Chalcedonian theologians regarding the virgin birth of Jesus. The delegation of Armenian bishops and archimandrites was headed by Catholicos Hovhannes III Odznetsi. At that time Armenia was conquered by the Arabs, who turned the country into a province (in Armenian, ostikanate), with Armenian nakharars continuing to rule it as vassals of Arab amirs. Initially, the council was scheduled to be held at Artsn, a town near Karin (Erzrum), but the Arab governor forbade convening the meeting outside his domain, intending to exploit the alliance of the two largest Orthodox churches in Eastern Asia Minor against the Byzantine expansionist policies. Almost three centuries later, Manazkert was annexed to the Byzantine empire. In the ninth through eleventh centuries, Manazkert became the center stage of the Tondrakian religious movement, characterized by both Armenian and Byzantine church authorities as a heretical sect. The movement was centered on the area around Mount Tondrak, north of Lake Van. The votaries of the movement rejected the church hierarchy, supported property rights for the peasants and equality between men and women. On the other hand, the Tondrakians made a distinction between the God who created the material world and the God of Heaven who, they believed, alone should be venerated, considered Jesus Christ an angel, rejected the Old Testament, and denied the immortality of the soul and the afterlife. Having rocked the Armenian orthodoxy for almost two centuries, the movement was quelled during his tenure of Grigor Magistros, a Byzantine governor of Vaspourakan, Taron, Manazkert and other counties. Saint Bartholomew (Surb Bardoughimeos) monastery near the town of Aghbak southeast of Lake Van (Source: Vardzk/Duty of Soul, Issue 2, Research on Armenian Architecture, July-November 2010, Yerevan). 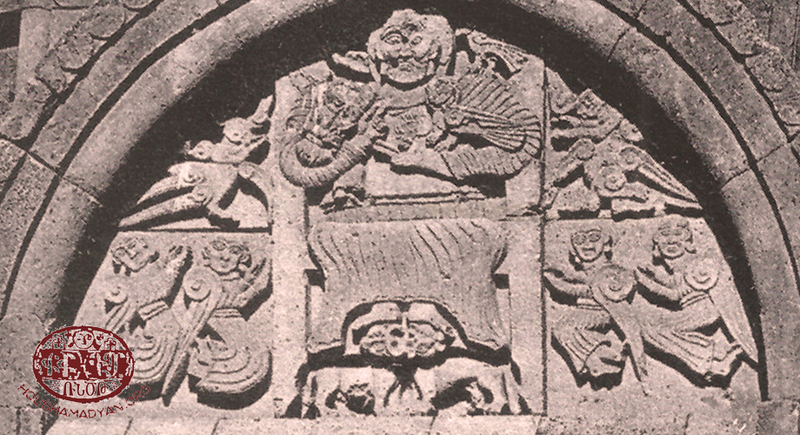 Until the beginning of the nineteenth century, Manazkert churches and monasteries were under the jurisdiction of the Vandir or Saint Aghberik (Surb Aghberik or Aghberkavank) monastery located 103 kilometers (64 miles) southwest of Manazkert in the kaza of Khout-Brnashen of the Sassoun sandjak of the vilayet of Bitlis. From then on, the vice-prelacy in Manazkert administratively reported to the prelacy in Moush located 102 kilometers (63 miles) southwest of Manazkert. The jurisdiction of the Moush prelacy extended over the counties belonging to the Moush and Gench (Genç) prefectures. Immediately before the genocide, the prelate of Moush was Supreme archimandrite Vardan Hakobian. He succeeded Bishop Nerses Kharakhanian, who died on April the tenth, 1915, and did not witness the annihilation of his people  that started fourteen days later. In 1907, as the abbot of the Saint John the Baptist (Surb Karapet) monastery, Father Vardan sent an entreaty to Czar Nicholas II. In it, the desperate cleric pleaded the Russian monarch to help free the Armenian populations of Manazkert, Bulanik, Moush, and Sassoun from the yoke of Turkish and Kurdish oppressors and establish a Russian consulate in Moush as a measure to safeguard Armenian lives. Supreme archimandrite Vardan Hakobian shared the fate of tens of thousands Armenians of Moush, who were subjected to forcible deportation and murder during the genocide. He was beaten to death with crosiers in a Turkish prison somewhere near the town of Moush. 1) Supreme archimandrite Vardan Hakobian, the last clerical leader of Moush (Source: Hamazasp Voskian, Taron-Touruberani vankere (The Taron-Touruberan Monasteries), Vienna, 1953). 2) The title page of Teodik's book "Koghkota Trqahye Hogevorakanoutyan yev ir Hotin Aghetali 1915 Tariin" (The Calvary of Ottoman Armenian Clergy and its Flock’s Catastrophic Year of 1915), Tehran, 2014 (reissue). In the years before the genocide, the vice-prelate of Manazkert was Pastor Hovhannes Ter-Avetissian, a native of Noradin. In April of 1915, a group of Armenian men from the Van province managed to flee to Kzelyusouf, a village in the Manazkert county, but were killed by the Turkish gendarmes there. As soon as the crime became known, Father Hovhannes voiced his indignation to Ibrahim Khalil, the district governor (in Turkish, kaymakam) of Manazkert. When the Russian forces arrived at Manazkert in mid-May, Father Hovhannes mingled with the crowds of Armenians fleeing from Ottoman troops and managed to survive the massacres the troops committed as they advanced. Within a century after the genocide, all Armenian churches and monasteries in Manazkert, along with chapels, miniature chapel-like tempiettos (in Armenian, taghavarikner), cemeteries, and carved cross-stones khachkars, were completely destroyed. As of 1975, khachkars and tombstone remains at Alyar, church and khachkar remains at Noradin, and khachkars at Sultanmud still stood near these villages. Carved crosses on tombstones at Bostankhaya and carved crosses with donation inscriptions on a rock at Dolaghbash remained visible. In the photograph below, taken in 2007, Armenian inscriptions on the rock at Dolaghbash were already effaced. 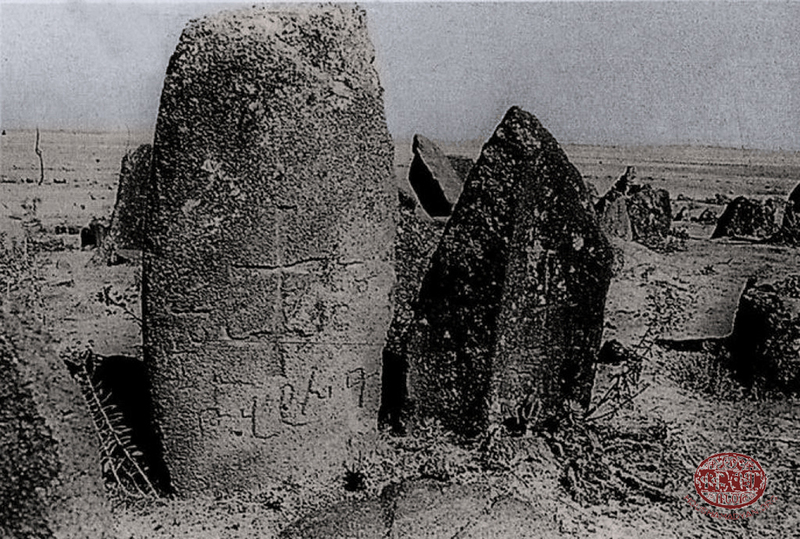 Carved crosses and tombstone remains in Manazkert as of 1975 (Source: Armenian architecture microfilm collection: Malazgirt (Manazkert) area, Turkey (A-2001): Medieval Funerary Stones-Khachkar, G. Bruchhaus, 1975). As of 2014, one oxygonal, cradle-like tombstone lay in the Manazkert fortress. The tombstone, which apparently was brought from a nearby cemetery, dated back to the sixteenth or seventeenth century and bore a half-desecrated cross on one side and Armenian inscriptions on two other sides. Armenian crosses and donation inscriptions on a rock near Dolaghbash, as of 1975 (Source: Armenian architecture microfilm collection: Malazgirt (Manaskert) area, Turkey (A-2001): G. Bruchhaus, 1975). 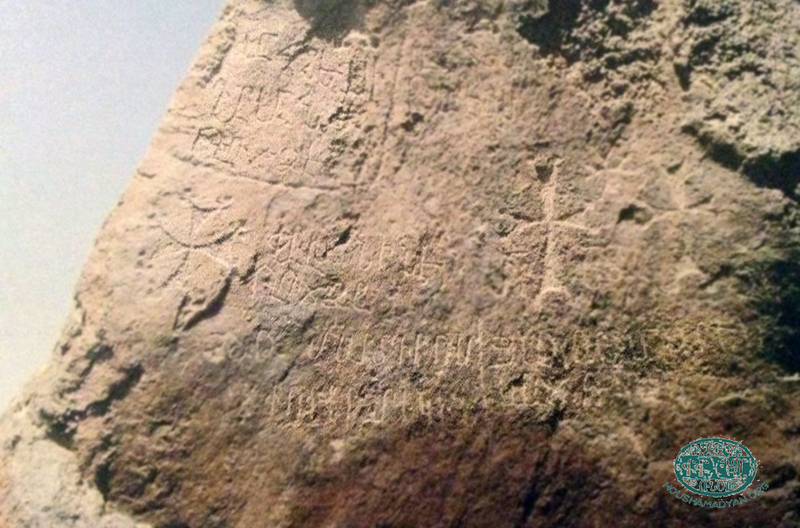 A rock bearing carved crosses and an inscription “cross [was] elevated” (in Armenian, kanknecav khaches) was found near the southeastern quarter of Oghdjin (present-day Okçuhan),  a formerly Armenian-inhabited village situated five kilometers (three miles) west of Manazkert. Below is a list of monasteries, churches, and places of pilgrimage in the kaza of Malazgirt during the Ottoman era. Wherever possible, the list includes information regarding the number of the serving clergy, which was extracted from the last of a three-volume travel guide published in 1885 by ethnographer Manuel Mirakhorian, as well as the names of the clergymen, which were obtained from the 1902 Patriarchate census data collected by Ter-Karapetian. Unless otherwise mentioned, the information submitted below is drawn from sources covering a period of about thirty years or from the mid-1880s to 1915. Monasteries and convents, both undamaged and dilapidated, were abundant in the Malazgirt county. In the medieval era, some monasteries in the county evolved to become major centers of arts and sciences on a par with large populated areas. Besides being the sites where monks lived under religious vows, some monasteries were considered sanctuaries by the locals. Others, such as the convent at Gumbayt, a village in the Apahunik gavar, and monasteries at Arsé (Hesé) and Tondrak, housed scriptoriums,  writing rooms that were set aside for the use of scribes, typically monks themselves, engaged in storing and copying manuscripts. The 1902 Patriarchate census of the population of towns and villages on the Plain of Moush and its vicinity listed around eleven monasteries. The 1913 Patriarchate census listed around 37 monasteries. Raymond Kévorkian and Paul Paboudjian, authors of the treatise “Armenians in the Ottoman Empire on the Eve of the Genocide,” raised the figure to 45, using supplementary Patriarchate census data available to them. The Armenian-populated villages of the kaza of Malazgirt during the last years of the Ottoman Empire. Click on the image to see details (map prepared by Tigran Martirosyan). One unnamed dilapidated monastery. The ruins of this formerly large structure stood on a barrow near the northern quarter of the village. Two unnamed dilapidated monasteries. One of them stood near the northern quarter of the village. One unnamed dilapidated monastery. This monastery is not to be confused with the one that stood in the homonymous Armenian-inhabited locality in Moush county (present-day Yücetepe), situated 27 kilometers (seventeen miles) north of the city of Moush at the site of the historical village of Ashtishat. Two dilapidated monasteries, Tsartpov vank and Karmir vank. The monastery stood not far from the village and by the late eighteenth century was in a dilapidated state. There were, in fact, two Akner villages, Upper and Lower. However, sources used for this study did not indicate which of these two villages Khangari vank was closer to. The monastery became dilapidated by the early twentieth century. Some sources identify Surb Gevorg as a church. There were, in fact, two monasteries bearing the same name. One was located east of the village. The other one stood north of the village. Formerly an intact domed structure known by the name of Surb Astvatsatsin, the monastery by the late nineteenth century fell into disrepair figuring as an unnamed monastery in most sources. Tevkants reported that by the mid-nineteenth century Surb Hovnan Voskeberan was a dilapidated monastery. Also called the Holy Mother of God (Surb Astvatsatsin) monastery, Surb Nikoghayos was in a dilapidated state throughout the centuries before the genocide. By the early twentieth century, outer walls caved in, but the rest of the vaulted structure remained only half-ruined. Also called Saint Patriarch Nerses (Surb Nerses Hayrapet), the monastery stood a 15-minute walk from the town center. By the early twentieth century, the monastery shrunk considerably because of the destruction and was converted into a chapel with an area barely measuring three to four square meters. The foundation had sunk insomuch that visitors would bend down in order to enter the chapel. The monastery was situated at a short distance from Manazkert, east of the town. In the monastic graveyard stood beautifully carved khachkars, some dating back to the twelfth and thirteenth centuries or even earlier. Also called the Hovhan Odznetsi monastery (Hovhan Odznetsu vank), Surb Hovhannes was located near Noradin, a village where in 726 an ecumenical council mentioned above was convened. In the large monastic graveyard stood khachkars complete with elaborate designs, some dating back to the thirteenth century, as well as several tombstones. In the early twentieth century, ruins of the outer walls of the monastery still stood. The chapel that was erected on the site of the destroyed church reportedly remained intact until the 1920s. In the ninth century, Surb Hovhannes became a place of assembly of the Tondrakians. The monastery became dilapidated by the early twentieth century. The 1913 Patriarchate census listed two dilapidated monasteries in the village. In the late nineteenth century and prior to the genocide, there were more than a hundred Armenian or formerly Armenian-inhabited or mixed-population villages in the kaza of Malazgirt. Almost every Armenian village had a church; larger ones had two or more churches. There were also ruins of churches and chapels that stood especially to the west and south of the town of Manazkert, some named, but most unnamed. Almost every functioning church had serving clergy. Ottoman salnames, government annuals containing statistical data for the state and provinces, stated that in 1871, 1872, and 1873 in the kaza of Malazgirt there were thirteen, twelve, and thirteen Armenian churches, respectively. The 1878 Patriarchate census of the Moush prefecture, for unknown reason, mentioned only four churches in Manazkert. The 1902 Patriarchate census of the population of towns and villages on the Plain of Moush and its vicinity listed about 63 churches, many dilapidated. The 1913 Patriarchate census listed nineteen churches in the county, a figure that Kévorkian and Paboudjian raised to 25, using supplementary Patriarchate census data available to them. The Church of the Holy Mother of God (Surb Astvatsatsin). The Church of Saint George (Surb Gevorg). The Church of Saint John (Surb Hovhannes). According to Ter-Karapetian, Surb Hovhannes was built of wood. The Church of the Holy Mother of God (Surb Astvatsatsin). According to Ter-Karapetian, Surb Astvatsatsin was built of wood, in 1800. Mirakhorian reported that Surb Astvatsatsin was an unsightly and dark, yet wonder-working church. A local folktale had it that moufflons once came and lay down at the entrance with their necks uncharacteristically craned. After waiting for an hour or so, the pastor asked the bell-ringer to bring salt so have it blessed before slaughtering one of the animals. Considered a sacrificial offering to God, called matagh in Armenian, boiled meats were then handed out to the meek and needy. Two dilapidated churches of Saint James (Surb Hakob) and Saint Sahak (Surb Sahak) also stood in the village. Two serving clergymen, Father Sahak and Father Baghdasar. The Church of Saint George (Surb Gevorg). Surb Gevorg was built of stone. There was another, unnamed and dilapidated, church in the village. Two serving clergymen, Father Baghdasar and Father Gevorg. One unnamed church. Two serving clergymen, Father Shmavon and Father Haroutiun. The Church of the Holy Mother of God (Surb Astvatsatsin). Surb Astvatsatsin was an ancient church. One serving clergyman, Father Haroutiun. One unnamed church. In the large graveyard near the village stood tombstones bearing Greek and Armenian inscriptions. One unnamed church. The church was an ancient structure located near the eastern quarter of the village. One unnamed church. One serving clergyman, Father Mkrtich. The Church of Saint James (Surb Hakob). According to Ter-Karapetian, Surb Hakob was built of wood, in 1841. There was another, unnamed and dilapidated, church in the village. The Church of Saint Toukhmanuk (Surb Toukhmanuk). One serving clergyman, Father Khachatour. The Church of John the Baptist (Surb Karapet). Formerly a monastery, Surb Karapet was an ancient, yet simple and unornamented, structure. According to Ter-Karapetian, Surb Karapet was built of wood. Several stones of the altar were engraved with cuneiforms. One serving clergyman. One unnamed dilapidated church. The ruins were located near the eastern quarter of the village. The Church of the Holy Mother of God (Surb Astvatsatsin) and the Church of Saint Sargis (Surb Sargis). According to Lynch, Surb Astvatsatsin was a pleasing peace of architecture and evidently a royal chapel. Another name Surb Astvatsatsin was known under, Yerek Khoran Astvatsatsin, was derived from the three apses that the church was complete with. The interior had a length of 62 feet and a breadth of 40 feet. The nave was separated from the aisles by two rows of three pillars apiece. The walls had once been covered with frescos. According to Ter-Karapetian, Surb Astvatsatsin was destroyed in 1885; the roof fell in and one of its apses crumbled. Surb Sargis, according to Bishop Srvandztiants, was an ancient and splendid edifice. This view is shared by Lynch, who reported that Surb Sargis apparently was a town church, complete with three apses. The interior had a length of 66 feet and a breadth of 39 feet. 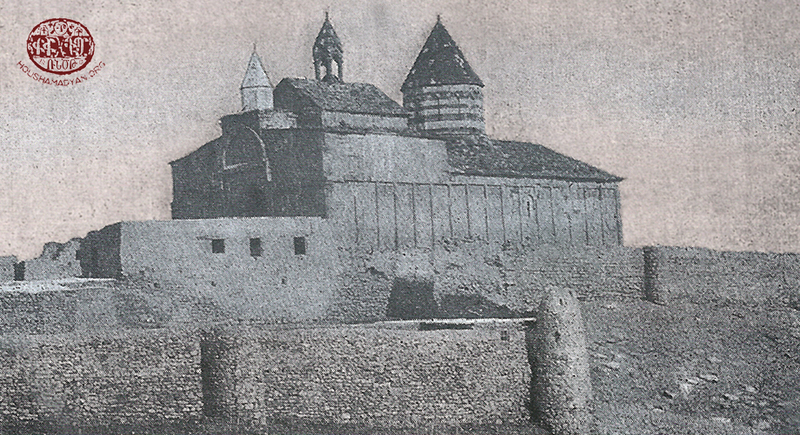 Built in 1139, Surb Sargis, according to Ter-Karapetian, in the early twentieth century was still a place of worship. However, the church, in Lynch’s words, was “maintained in a filthy state.” The two rows of three pillars were seen still standing in the late nineteenth century. A little sacristy adjoined a chapel on the north. Abutting on the western front of this sacristy was placed an independent chapel, already a ruin by then. The chapel was known under the name “church of the Arabs,” or Arab kilise, in Turkish. Lynch presumed that by the ethnonym “Arab,” Turks denoted the Nestorians, possibly because in the early Middle Ages the Nestorian Christianity was spread in the Arabian Peninsula. Tevkants reported the Church of the Holy Mother of God (Surb Astvatsatsin) and the Church of Saint Minias (Surb Minas) in the town. Reconstruction of the tenth-century plan of Manazkert. The Church of the Holy Mother of God (Surb Astvatsatsin) is in the lower right quadrant. The Church of Saint Sargis (Surb Sargis) is in the lower central quadrant. (Source: Jacque de Morgan, The History of the Armenian People: From the Remotest Times to the Present Day, Boston, 1965). Near Surb Sargis stood a small, yet beautiful, unnamed church. Two other churches in Manazkert were the Church of Saint John the Baptist (Surb Karapet) and the Church of Saint James (Surb Hakob). As a consequence of a devastating earthquake in May of 1903 centered near Mount Sipan,  all churches, except for Surb Sargis, were reduced to rubble. Two clergymen, who apparently served at one of the churches mentioned above, were Father Poghos and Father Yeghiazar. One unnamed church. According to Ter-Karapetian, the church was an ancient structure. The Church of Saint James (Surb Hakob). Built of stone, Surb Hakob was complete with three apses. Two serving clergymen, according to Mirakhorian. Ter-Karapetian reported that there was one serving clergyman, Father Hovhannes. The 1878 Patriarchate census listed the Church of Saint Stephen (Surb Stepanos) in the village. The Church of Saint George (Surb Gevorg). Surb Gevorg was a splendid four-pillar structure built of stone, in 1639. In the churchyard stood a beautiful chapel. Legend had it that the village name originated from the Armenian word voghdjuin, meaning “greeting,” as if a merchant passing through the village saw trees exchanging greetings with one another. In order to be certain of what he saw, the merchant commissioned the local priest to say mass. The trees responded to the liturgy with greeting each other by bowing. Tevkants reported the Church of Saint John the Baptist (Surb Karapet) in the village. The Church of Saint Toukhmanuk (Surb Toukhmanuk). Two serving clergymen. The 1878 Patriarchate census listed the Church of Saint John the Baptist (Surb Karapet) in the village. The Church of the Holy Mother of God (Surb Astvatsatsin). Ter-Karapetian reported that there was an unnamed dilapidated church built of stone and complete with elaborate designs. One unnamed dilapidated church. In the late seventeenth century, an Armenian copy of an ancient gospel was made in the village. The Church of Saint Sargis (Surb Sargis). Formerly a monastery, the church stood near the northern quarter of the village. The monastery of the Holy Mother of God at Argelan (Argelana Surb Astvatsatsin or Surb Stepanos Ter Houskan vordu vank) in 2006. Photos by S. Karapetian (Source: Vardzk/Duty of Soul [English version], Issue 1, Research on Armenian Architecture, 2015, Yerevan). The Church of Saint Stephen (Surb Stepanos). The ruins of an unnamed monastery that stood near the northern quarter of the village were considered a sanctuary by the locals. Near the Saint George (Surb Gevorg) church sprang the well “Lousaghbyur.” The sick used its water to bathe sore eyes, while the healthy sprayed it on body parts to prevent sickness. In fact, there were quite a few spring-wells that were called “Lousaghbyur” near intact or dilapidated monasteries. Legend had it that after bathing his eyes with the well-water, a blind man had recovered his sight, thus the name “lousaghbyur,” that is, waters endowed with the power to bring the light of day. Once a year, for the feast of the Transfiguration of Jesus (Vardevar or Vardavar), Armenian residents of adjacent villages of Bulanik and Manazkert counties made a pilgrimage to the Surb Daniel monastery. During the festivities, horsemen grass hockey djirid, as well as dances, chants, and sacrificial offerings, were arranged at the monastery. Located in the kaza of Bulanik 24 kilometers (fifteen miles) southeast of Manazkert, Surb Daniel is not to be confused with the homonymous monastery in the kaza of Malazgirt mentioned above or its chapel mentioned below. Situated at a short distance east of Manazkert, the chapel apparently formed part of the homonymous monastery. 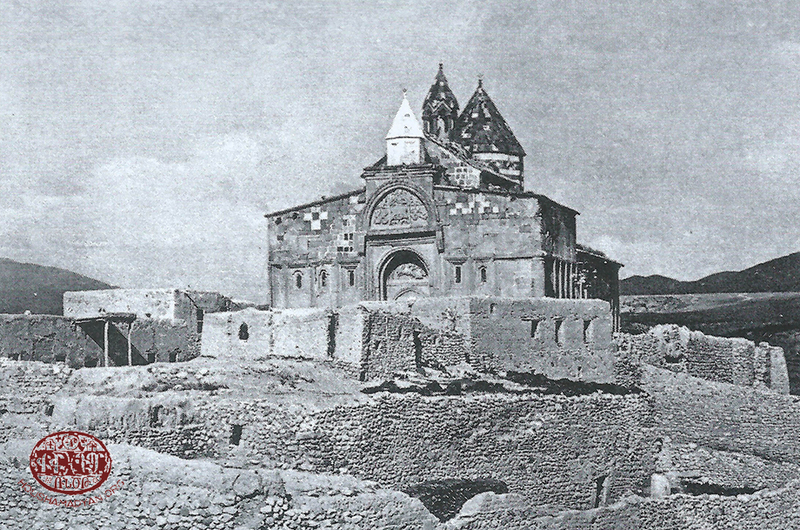 Surb Daniel chapel was considered a sanctuary not only by the Armenians, but also the Kurds, who made their own pilgrimages there. This small, cabin-like chapel, called “loostun” in the local parlance, stood at the homonymous monastery. Surb Hovhannes Odznetsu chapel was considered a sanctuary and was visited for veneration especially by the local Armenian women. The monastery was considered a sanctuary where the locals went to worship Surb Sargis. A general in the Roman army, Sargis suffered martyrdom together with his son Martiros after refusing to recant his Christian faith. In Malazgirt, sanctuaries where Surb Sargis was venerated were fewer compared to places of worship of other saints, such as Saint George (Surb Gevorg) or Saint Toukhmanuk (Surb Toukhmanuk). Nevertheless, Surb Sargis was one of the most revered saints in the county  and the neighboring kaza of Bulanik. The saint was held in veneration insomuch that local Armenians would observe a fast for him. Near the Surb Nshan church sprang a spring-well. Its water tasted sweet and was considered life-giving (in Armenian, anmahakan djour) and thus sacred. Stemming from a cliff, the water flowed through a cupped rock and into the Aratsani (Murat) River, which was two stones’ throw away. Within an hour’s walk southwest of Manazkert there were ruins of two or three churches, which served as a place of pilgrimige for the Armenian villagers. A popular folk tradition held that at the site of the ruins once stood a monastery, called “Red Monastery” (in Armenian, Karmir vank). Not far from Karmir vank stood a large boulder measuring two by one meter and a half (around seven by five feet). It was a naturally hewn rock, flat and oval-shaped at the top, and carved out like trough. 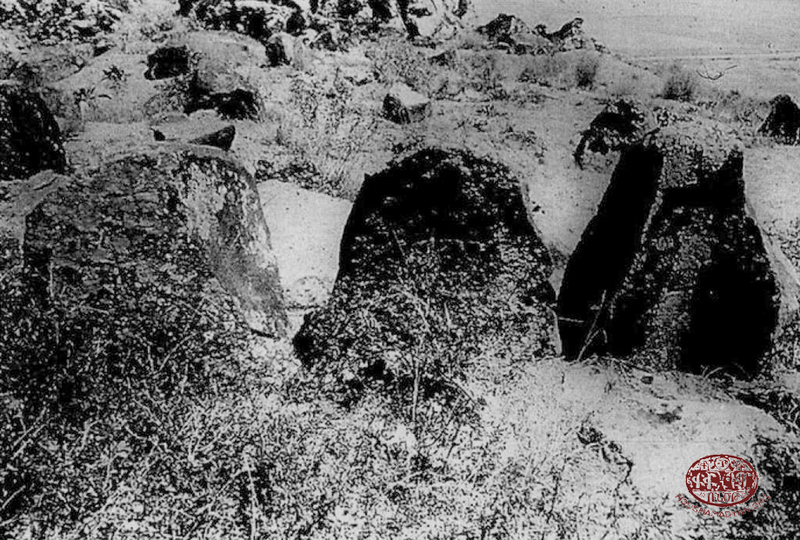 Armenians called it “seghankar” or “seghani kar,” while amongst Kurds the boulder was known as “giavre kafran,” meaning “idolaters’ boulder.” Legend had it that in ancient times at the site of the boulder stood a heathen temple. Several sources identified Karmir vank as a sanctuary located southwest of Manazkert. Hakobyan et al., however, placed the boulder, which reportedly stood not far from Karmir vank, south of Manazkert, near the deserted Armenian village of Sndjan. 1) The title page of Ghukas Inchichian’s treatise Ashkharagroutiun choric masanc ashkhari (The Geography of the Four Cardinal Points), volume 1. Venice, 1806. 2) The title page of A-To's (Hovhanness Der Mardirossian) The Vilayets of Van, Bitlis and Erzurum [in Armenian], Yerevan, 1912. 3) The title page of Hamazasp Voskian's Vaspourakan-Vani vankere (The Vaspourakan-Van Monasteries), volume 1, Vienna, 1940. In the eastern quarter of the town stood a religious edifice, which the locals called “Mother church” (in Armenian, Mayr yekegheci). The walls and the corners of the structure, as well as the elaborate khachkars that stood nearby, were considered sacred. Near the Mother church were the ruins of a smaller, arched church. The church was almost entirely embedded in the ground to the extent that its flattened roof formed a section of a country road. Near the village there was a sanctuary, purportedly a monastery, which was still seen in the late nineteenth century. After Armenians had to abandon the village, apparently during the 1877-1878 Russo-Turkish war, the sanctuary was destroyed by a local Kurdish sheikh. Kristonya Hayastan Hanragitaran (Christian Armenia Encyclopedia). (Yerevan: Armenian Encyclopedia Publishers, 2002), p. 35. Bedrosian, Robert. “Armenia during the Seljuk and Mongol Periods,” in Armenian People from Ancient to Modern Times, Richard Hovannisian (ed. ), volume 1. (New York: St. Martin’s Press, 2004), pp. 246-247, 249. Nicolle, David. Manzikert 1071: The Breaking of Byzantium. (Oxford: Osprey Publishing, 2013), p. 91. Inclosure in No. 25. Consul Taylor to the Earl of Clarendon. Erzeroom, March 19, 1869, in British Documents on Ottoman Armenians, volume 1: Turkey No 16 (1877), pp. 16-36, No. 13/1. Lynch, H.F.B. Armenia: Travels and Studies, volume 2: The Turkish Provinces. (London, New York: Longmans, Green, & Co., 1901), p. 275. Vantir or Saint Aghperig Monastery (Vantir or Surp Aghperga Vank), in Collectif 2015: Réparation, Union Internationale des Organisations Terre et Culture. Kévorkian, Raymond, and Paul Paboudjian. Les Arméniens dans l’Empire Ottoman à la veille du genocide. (Paris: ARHIS, 1992), p. 59. Lynch, op. cit., p. 171. Parsegian, V. Lawrence (Project Director, Rensselaer Polytechnic Institute). Malazgirt (Manaskert) area, Turkey (A-2001), 5: 033; 6: 080-082, in Cumulative Index and Guide to the Armenian Architecture: Microform Collection, Books I-VII. Leiden: Inter Documentary Company, 1990. Massis, July 12 (no. 28). Constantinople, 1903. Hakobyan et al., op. cit., volume 2, p. 617. Lynch, op. cit., p. 271. Srvandztiants, Garegin. Toros Aghpar. Hayastani Champord (Toros Aghpar: A Traveler around Armenia). (Constantinople: G. Baghdadlian (Aramian) Publishing House, 1885), volume 2, p. 278. Lynch, op. cit., p. 272.
 Review of the Permanent Seismic Committee of the Russian Imperial Academy of Sciences, volume 2. (Saint Petersrburg: Imperial Academy of Sciences Press, 1905), p. 94. Teodik, op. cit., p. 141. Mirakhorian, op. cit., pp. 58-59. Srvandztiants, op. cit., volume 2, p. 278. Ghanalanyan, op. cit., p. 105. Hambavaber, June 19 (no. 25). Tiflis, 1916. Hakobyan et al., op. cit., volume 1, p. 731. Ararat, April 30 (no. 4). Mother See of Holy Etchmiadzin, 1872. Byuzandion, June 22-July 5 (no. 1127). Constantinople, 1900. Mirakhorian, op. cit., pp. 54-55. Mirakhorian, op. cit., p. 48.